Horseradish is used as an appetizing spice. Its high Vitamin C content brings digestive and anti-scorbutic properties. The roots of the horseradish, rated, are mainly used as a mustard substitute. They have a strong taste, spicy and peppery. It participates to trigeminal sensation. 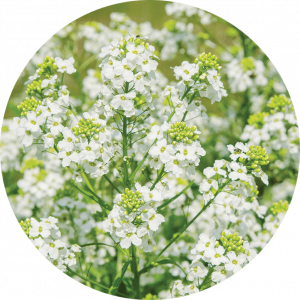 Horseradish essential oil is used as a flavouring ingredient in sauces, marinades and dressings for prepared food, sushi & raw fish, hummus, and pickles vinegar. 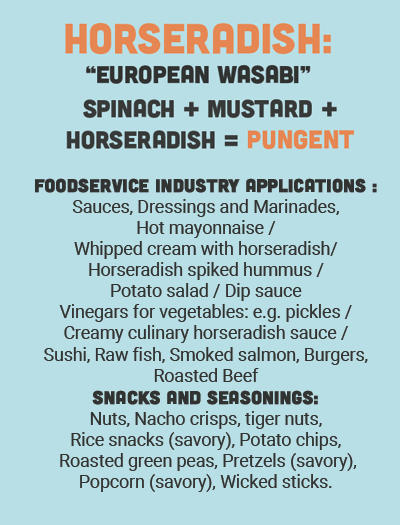 Horseradish essential oil is also famous in a wide range of snacking applications: Nuts, Nacho crips, rice savory snacks, potato chips, roasted green peas, Pretzels, Pop corns and wicked sticks.